This week, I wanted to introduce you to an amazing collection of stories about a young Himba woman named Binti. Binti is a brilliant mathematician who leaves her village to attend a prestigious university on a different planet. This wonderful story is written by Nnedi Okorafar. She is a woman you should keep an eye on. In fact, her novel, Who Fears Death, has been optioned by HBO and is now in early development as a TV series with George RR Martin as executive producer. Clearly, she knows the art of storytelling. Binti is a refreshing novella about a woman who decides to leave everything she knows to pursue her own dreams. I loved that Binti is a math prodigy – the first from her village to be invited to attended a university on another planet. She has such an amazing strength and perseverance, even when faced with truly horrible situations. And she endures so much – violence, bullying, stigmatization – but she continues to pursue her path, her dream. She finds common connections with those that are different. It’s a story of acceptance and finding peace and friendship among those we might otherwise ostracize. While its a story set throughout the stars with alien cultures, it messages apply to all of us. And it also has a message about artifacts and the means of collecting said artifacts for display or study. Given the large number of museum collections that were obtained by inauspicious means, that too is a relevant point to consider. I still feel the same about “Binti” after rereading it within the new complete trilogy. Plus, reading the collection together at one time helps provide even more context and connection to the stories. The power of Binti’s journey becomes that much more apparent. The new trilogy adds a new story, “Binti: Sacred”, set between “Binti” and “Home”. This new story helps to address the criticisms I and others voiced about Home when it was released – namely the trauma that Binti suffered seemingly diminished and brushed aside. “Sacred” allows us to see Binti as she struggles with the events during her journey to Oomza University. Binti: The Complete Trilogy by Nnedi Okorafar is available now and is worth reading, whether it’s your first time or not. 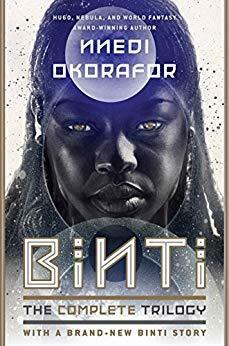 Collected for the first time in an omnibus, the Hugo- and Nebula-award-winning Binti trilogy, the story of one extraordinary girl’s journey from her home to distant Oomza University. In her Hugo- and Nebula-winning novella, Nnedi Okorafor introduced us to Binti, a young Himba girl with the chance of a lifetime: to attend the prestigious Oomza University. Despite her family’s concerns, Binti’s talent for mathematics and her aptitude with astrolabes make her a prime candidate to undertake this interstellar journey. But everything changes when the jellyfish-like Medusae attack Binti’s spaceship, leaving her the only survivor. Now, Binti must fend for herself, alone on a ship full of the beings who murdered her crew, with five days until she reaches her destination. There is more to the history of the Medusae—and their war with the Khoush—than first meets the eye. If Binti is to survive this voyage and save the inhabitants of the unsuspecting planet that houses Oomza Uni, it will take all of her knowledge and talents to broker the peace. Collected now for the first time in omnibus form, follow Binti’s story in this groundbreaking sci-fi trilogy. Nnedi Okorafor was born in the United States to two Igbo (Nigerian) immigrant parents. She holds a PhD in English and was a professor of creative writing at Chicago State University. She has been the winner of many awards for her short stories and young adult books, and won a World Fantasy Award for Who Fears Death. Nnedi’s books are inspired by her Nigerian heritage and her many trips to Africa. She can be found online at nnedi.com and on Twitter @nnedi.